I cooked these tofu burgers and welcomed a few companions over for lunch today. My friends are those sorts of fellows that truly believe that burgers should just be made of meat, and ideally cooked on a grill in the summer. 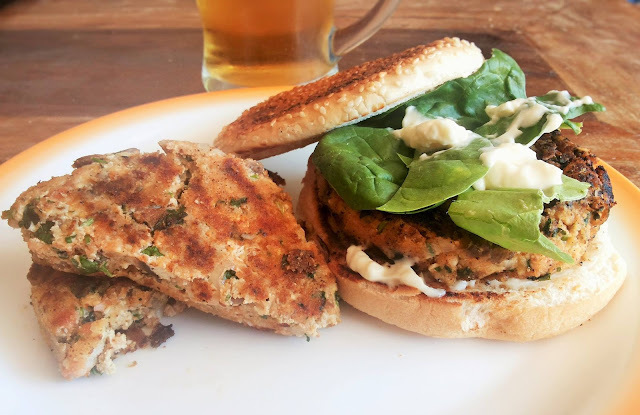 Be that as it may, I figured out how to give them these tofu burgers a try. The reaction was considerably more than positive: they surrendered and needed to admit that even the most tofu-skeptical person will fall in love with this veggie burger recipe. 1. In a pan, heat the olive oil and sautée the onions until soft. Add the mushrooms and cook for another 3-4 minutes. Remove from the cooker and leave to cool for a few moments. 2. In a food processor, add 250g of the tofu with the chopped garlic. Chop and add the fresh coriander leaves. Blend until smooth. 3. Transfer the mix to a bowl and stir in the onion and mushroom mixture. Add the breadcrumbs, tomato pureé, vinegar and sweet chilli sauce. Grate the remaining tofu and add it to the mixture. 4. Mix well and refrigerate for at least 30 minutes. 5. Divide this mixture into 6 patties. Press together well and coat them with extra breadcrumbs. 6. Add oil to a frying pan and fry the patties until golden, being careful when turning them over as they may break. 7. Toast the burger baps and spread some mayonnaise on one side of each roll. 8. Place one tofu burger on each bap, followed by the spinach leaves and a dollop of mayonnaise.